The following lists Masses in Arkansas that are celebrated in Latin (the Extraordinary Form of the Roman Rite). 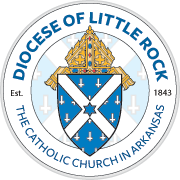 Click on a parish below for address and contact information. Holy Redeemer Church El Dorado 5 p.m.
St. John the Baptist Church Cabot 8 a.m., 10:45 a.m.
St. Joseph Church Tontitown 4:30 p.m.
St. John the Baptist Church Cabot 8 a.m.
St. John the Baptist Church Cabot 6:30 p.m.
St. John the Baptist Church Cabot 7 a.m.
St. John the Baptist Church Cabot 8 a.m., 6:30 p.m.